Spinergy Resuscitate is professional strength, acidic formula specifically formulated for use on tile and grout which does not respond to other cleaning agents. It cleans away hard water spots and deposits, grout haze, soap scum, and efflorescence. It renews the appearance of ceramic tile, porcelain tile, grout, granite, slate, and sandstone. It is also biodegradable and emits fewer vapors than typical acid cleaners. Resuscitate is used when all other cleaners have failed, and is a safer alternative than aggressive acids like phosphoric and muriatic. The proprietary organic acid is twice as effective in dissolving calcium carbonate than phosphoric acid, yet is classified as only a mild skin irritant. 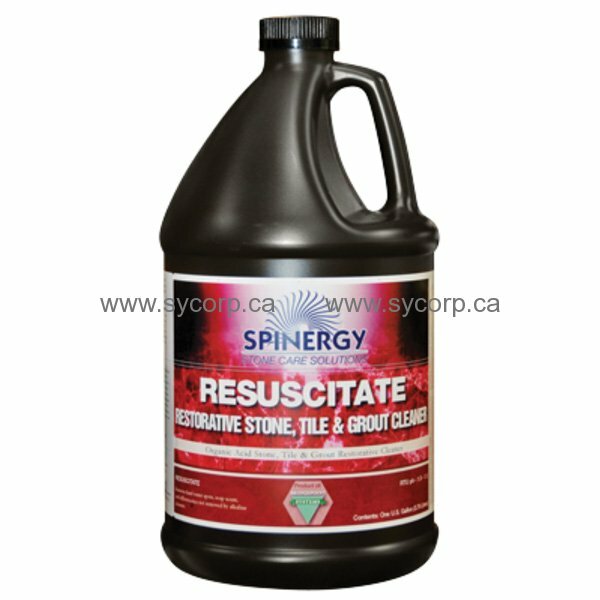 Spinergy Resuscitate will readily remove the embedded soil layer thereby renewing the surface of the grout.